1990s: David Ramler and Family, the benefactors. 1998: The City of Boston and The Friends of Ramler Park, the catalysts. January 2001 signage announced the Future Home of Ramler Park. 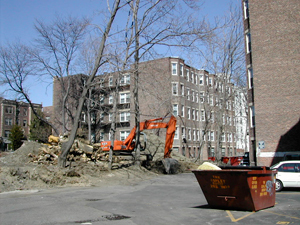 The City of Boston had not acquired new park land for decades until 1998, when Mayor Thomas Menino instituted the “Open Space Acquisition Policy.” Ramler Park was one of the first acquisitions in this program designed to partner neighborhood initiatives with City resources in the preservation of open space and creation of new parks. Seizing this opportunity, residents formed the Friends of Ramler Park, Inc. to promote the development, programming, and maintenance of Ramler Park. 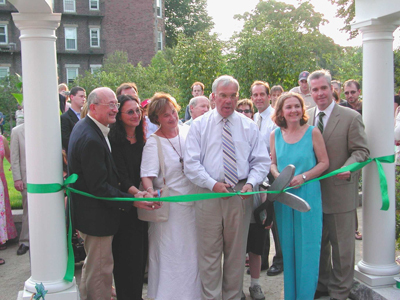 On August 28, 1999, Mayor Menino and Parks Commissioner Justine Liff hosted Fenway neighbors and friends in a celebration that marked the gift of land to the Boston Parks Department and the beginning of The Friends of Ramler Park Capital Campaign. 2000-2004: Ramler Park Landscape Design and Development, the process. The Friends began fundraising, first for planning purposes and then for a capital construction match to the city of Boston’s capital allocation. The Friends conducted a charrette in the summer and fall of 2000, running a series of public community meetings to discuss design options. 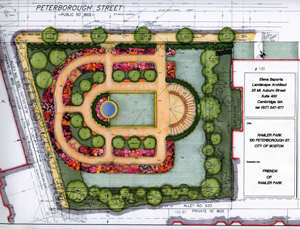 Elena Saporta, Landscape Architect, was granted the design contract, and developed her designs in harmony with neighborhood desires, working with The Friends and The City of Boston. Construction begins at Ramler Park. View from the back of the lot, towards Queensbury Street. Phase I began in late 2000, and continued through 2001, clearing the land, grading, soils remediation, infrastructure, and hardscapes. Phase II, 2002-2004, involved the tree plantings, installation of the pergola and fountain, finalizing the walkways, installing the perennials and grasses, and completing the fence. The plantings were chosen to offer shade, beauty, visual diversity, and support for the birds, bees, and butterflies who live in or migrate through the Fenway. Flowering crabapple and dogwood trees ring the central walkways, complimented by a trio of towering Dawn Redwoods in the NW corner. A variety of deciduous trees were chosen for fall color, as well as to screen the adjacent brick buildings facing Peterborough Street. A wall of white pines defines the back edge of the park providing a soft-green living fence to obscure the back alley. Ramler Park was planted with the intention to attract and support the migrating bird populations that pass over the Fens. Flowering trees in the spring and colorful berries throughout the winter offer sustenance to our feathered friends. A listing of bird species seen in the the Fenway has been inscribed in a brick walkway under the trellis. 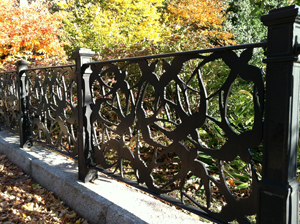 And a decorative motif, “Birds of the Fenway” was used in the design of the artistic fence that rims the park, created by the artist John Tagiuri and funded by the Edward Ingersoll Browne Fund. Birds of the Fenway – this custom fence commission was created by John Tagiuri for Ramler Park in 2004. 2004: The Official Opening of Ramler Park. 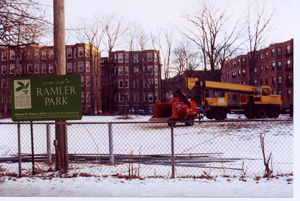 On August 10, 2004 the community celebrated the official opening of Ramler Park, thanks to Mayor Menino’s commitment to open space, the good will and donations from local businesses, academic and residential leaders, and the generous civic spirit of David Ramler and his entire family. Ramler Park Ribbon Cutting August 10, 2004 with Mayor Menino, Friends of Ramler Park and members of the Ramler family.